PHOENIX, Feb. 9, 2012 /PRNewswire/ -- Republic Services, Inc. (NYSE: RSG) today reported net income of $191.0 million, or $0.51 per share, for the three months ended December 31, 2011, versus $147.6 million, or $0.38 per share, for the comparable period last year. Republic's net income for the three months ended December 31, 2011 and 2010 includes a number of charges and other expenses that impacted its results. A detail of these charges and other expenses is contained in the Reconciliation of Certain Non-GAAP Measures section of this document. Excluding these items, net income for the three months ended December 31, 2011 and 2010 would have been $195.3 million, or $0.53 per diluted share, and $160.8 million, or $0.42 per diluted share, respectively. Excluding certain charges and other expenses recorded during 2011 and 2010 as described in the Reconciliation of Certain Non-GAAP Measures section of this document, adjusted earnings before interest, taxes, depreciation, depletion, amortization and accretion (adjusted EBITDA) for the three months ended December 31, 2011 would have been $603.6 million, or 29.8% as a percentage of revenue, compared to $616.8 million, or 30.5% as a percentage of revenue, for the comparable 2010 period. Revenue for the three months ended December 31, 2011 increased to $2,025.2 million compared to $2,020.8 million for the same period in 2010. Core price for the three months ended December 31, 2011 increased 0.6%, fuel recovery fees increased 1.0% and acquisitions / divestitures, net increased 0.3%. Partially offsetting this revenue growth of 1.9% were decreases in recycling commodities pricing of 0.1%, volume of 0.2% and 1.4% due to the end of our San Mateo County collection contract and our disposal and transportation contract with the City of Toronto effective December 31, 2010. For the year ended December 31, 2011, net income was $589.2 million, or $1.56 per diluted share, versus $506.5 million, or $1.32 per diluted share, for the comparable period last year. Republic's net income for the years ended December 31, 2011 and 2010 includes a number of charges and other expenses that impacted its results. A detail of these charges and other expenses is contained in the Reconciliation of Certain Non-GAAP Measures section of this document. Excluding these items, net income for the years ended December 31, 2011 and 2010 would have been $738.3 million, or $1.96 per diluted share, and $657.8 million, or $1.71 per diluted share, respectively. Excluding certain charges and other expenses recorded during 2011 and 2010 as described in the Reconciliation of Certain Non-GAAP Measures section of this document, adjusted EBITDA for the year ended December 31, 2011 would have been $2,502.4 million, or 30.5% as a percentage of revenue, compared to $2,517.1 million, or 31.1% as a percentage of revenue, for the comparable 2010 period. Revenue for the year ended December 31, 2011 increased to $8,192.9 million compared to $8,106.6 million for 2010. Core price for the year ended December 31, 2011 increased 0.8%, fuel recovery fees increased 1.0%, commodities pricing increased 1.0% and acquisitions / divestitures, net increased 0.1%. Partially offsetting this revenue growth of 2.9% were decreases of 0.4% from core volume and 1.4% due to the end of our San Mateo County collection contract and our disposal and transportation contract with the City of Toronto effective December 31, 2010. "I am very pleased with our 2011 performance," said Donald W. Slager, President and Chief Executive Officer. "Our strong operational focus allowed the Company to achieve a record level of free cash flow. We continue to have a disciplined approach in the utilization of cash flow, which includes re-investing in our business, acquisitions and returning cash through share repurchases and dividends. During 2011, Republic returned approximately $770 million to its owners through repurchases and dividends. We remain focused on improving our return on capital through pricing that exceeds cost increases and initiatives that enhance our productivity. Additionally, we remain committed to maintaining our strong credit profile and investment grade ratings as we continue to grow the business." Republic also announced that its Board of Directors declared a regular quarterly dividend of $0.22 per share for stockholders of record on April 2, 2012. The dividend will be paid on April 16, 2012. Republic's guidance is based on current economic conditions which assume modest improvement in the overall economy in 2012. Please refer to the Information Regarding Forward-Looking Statements section of this document. Adjusted Free Cash Flow: We expect adjusted free cash flow for 2012 to be $775 million to $800 million. Adjusted free cash flow consists of cash provided by operating activities, less property and equipment received, plus proceeds from the sales of property and equipment. Adjusted free cash flow guidance excludes merger related expenditures, certain legacy tax settlement payments and the cash tax benefit for debt extinguishment. Adjusted Diluted Earnings per Share: We expect 2012 adjusted diluted earnings per share to be in the range of $1.98 to $2.02. Adjusted diluted earnings per share exclude loss on extinguishment of debt. Our guidance for fuel recovery fees and commodities assumes pricing at December 2011 levels. Property and Equipment: In 2012, we anticipate receiving $860 million of property and equipment. Purchases of property and equipment as reflected on our consolidated statement of cash flows for 2012 are expected to be $920 million and represent amounts to be paid during 2012 for such expenditures. The difference between property and equipment received and purchases of property and equipment is adjustments for $60 million of property and equipment received during 2011, but to be paid for in 2012. Margins: We expect EBITDA margins for 2012 to be 30.5%, consistent with our 2011 performance. Taxes: We expect our provision for income taxes in 2012, excluding loss on extinguishment of debt, to be 39.0%. In 2012, we expect cash taxes as a percentage of the overall tax provision, included in our adjusted earnings per share and adjusted free cash flow, to be approximately 80%. Mr. Slager, commenting on the Company's priorities, stated, "In 2012, we will continue to focus on and invest in productivity and cost improvement projects that will enhance our customers' experience with Republic. These projects include investing in automated collection vehicles, implementing a standardized maintenance program and expanding our fleet of natural gas vehicles. We also will continue to invest in people who assure our success with customers and allow us to be an employer of choice for top talent." 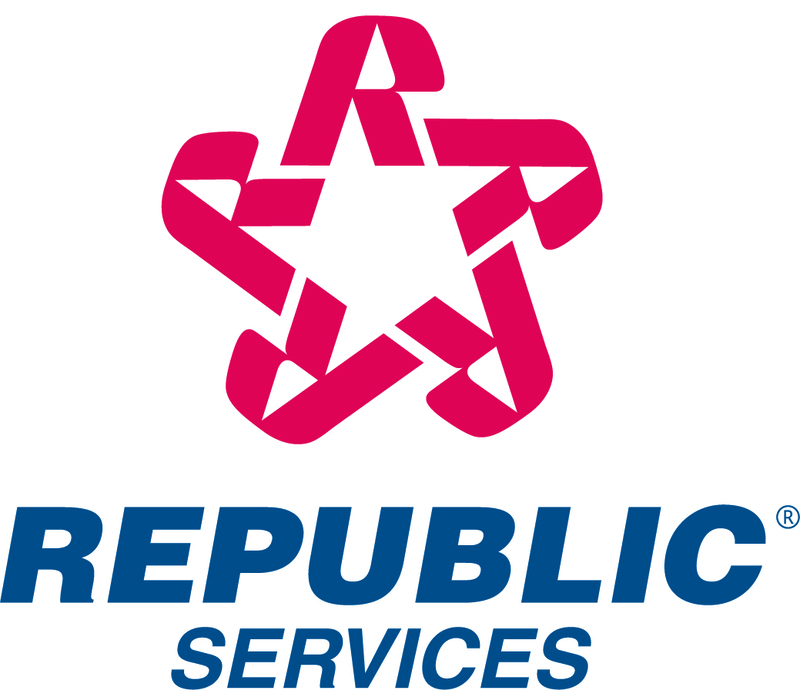 Republic Services, Inc. provides recycling and solid waste collection, transfer and disposal services in the United States. The Company's various operating units, including collection companies, transfer stations, recycling centers and landfills, are focused on providing reliable environmental services and solutions for commercial, industrial, municipal and residential customers. For more information, visit the Republic Services website at www.republicservices.com. The Company participates in investor presentations and conferences throughout the year. Interested parties can find a schedule of these conferences at www.republicservices.com by selecting "Calendar" under the Investor Relations tab. Live audio presentations from earnings calls and investor conferences are webcast on the Republic website. Basic earnings per share attributable to Republic Services, Inc. Diluted earnings per share attributable to Republic Services, Inc.
You should read the following information in conjunction with our audited consolidated financial statements and notes thereto appearing in our Annual Report on Form 10-K as of and for the year ended December 31, 2010. All amounts below are in millions and as a percentage of our revenue, except per share data. Cost of operations includes labor and related benefits, which consists of salaries and wages, health and welfare benefits, incentive compensation and payroll taxes. It also includes transfer and disposal costs representing tipping fees paid to third party disposal facilities and transfer stations; maintenance and repairs relating to our vehicles, equipment and containers, including related labor and benefit costs; transportation and subcontractor costs, which include costs for independent haulers who transport our waste to disposal facilities and costs for local operators who provide waste handling services associated with our national accounts in markets outside our standard operating areas; fuel, which includes the direct cost of fuel used by our vehicles, net of fuel credits; disposal franchise fees and taxes consisting of landfill taxes, municipal franchise fees, host community fees and royalties; landfill operating costs, which includes landfill accretion, financial assurance, leachate disposal and other landfill maintenance costs; risk management, which includes casualty insurance premiums and claims; cost of goods sold, which includes material costs paid to suppliers associated with recycling commodities; and other, which includes expenses such as facility operating costs, equipment rent and gains or losses on sale of assets used in our operations. The cost categories shown above may change from time to time and may not be comparable to similarly titled categories used by other companies. As such, you should take care when comparing our cost of operations by cost component to that of other companies. Selling, general and administrative expenses include salaries, health and welfare benefits and incentive compensation for corporate and field general management, field support functions, sales force, accounting and finance, legal, management information systems and clerical and administrative departments. Other expenses include rent and office costs, fees for professional services provided by third parties, marketing, investor and community relations, directors' and officers' insurance, general employee relocation, travel, entertainment and bank charges, but excludes any such amounts recorded as restructuring charges. The cost categories shown above may change from time to time and may not be comparable to similarly titled categories used by other companies. As such, you should take care when comparing our selling, general and administrative expenses by cost component to that of other companies. We believe that the presentation of EBITDA is useful to investors because it provides important information concerning our operating performance exclusive of certain non-cash and other costs. EBITDA demonstrates our ability to execute our financial strategy, which includes reinvesting in existing capital assets to ensure a high level of customer service, investing in capital assets to facilitate growth in our customer base and services provided, maintaining our investment grade credit rating and minimizing debt, paying cash dividends, repurchasing our common stock, and maintaining and improving our market position through business optimization. This measure has limitations. Although depreciation, depletion, amortization and accretion are considered operating costs in accordance with GAAP, they represent the allocation of non-cash costs generally associated with long-lived assets acquired or constructed in prior years. Our definition of EBITDA may not be comparable to similarly titled measures presented by other companies. During December 2011, we reached a settlement with the IRS on the treatment of a transaction involving partnership interests that were exchanged by Allied in 2002. Also during December 2011, the IRS completed its examination of Allied's 2000 through 2003 tax years. The resolution of these matters reduced our effective tax rate for the quarter and year. We believe that the presentation of adjusted EBITDA, adjusted pre-tax income, adjusted net income attributable to Republic Services, Inc., and adjusted diluted earnings per share, which are not measures determined in accordance with GAAP, provide an understanding of operational activities before the financial impact of certain items. We use these measures, and believe investors will find them helpful, in understanding the ongoing performance of our operations separate from items that have a disproportionate impact on our results for a particular period. Comparable charges and costs have been incurred in prior periods, and similar types of adjustments can reasonably be expected to be recorded in future periods. Our definition of adjusted EBITDA, adjusted pre-tax income, adjusted net income attributable to Republic Services Inc., and adjusted diluted earnings per share may not be comparable to similarly titled measures presented by other companies. We believe that the presentation of adjusted free cash flow provides useful information regarding our recurring cash provided by operating activities after certain expenditures. It also demonstrates our ability to execute our financial strategy and is a key metric we use to determine compensation. The presentation of adjusted free cash flow has material limitations. Adjusted free cash flow does not represent our cash flow available for discretionary expenditures because it excludes certain expenditures that are required or to which we have committed such as debt service requirements and dividend payments. Our definition of adjusted free cash flow may not be comparable to similarly titled measures presented by other companies. As of December 31, 2011 and 2010, accounts receivable were $825.8 million and $828.9 million, net of allowance for doubtful accounts of $48.1 million and $50.9 million, resulting in days sales outstanding of approximately 37 (or 24 net of deferred revenue) and 37 (or 24 net of deferred revenue), respectively. In October 2011, we paid a cash dividend of $81.6 million to stockholders of record as of October 3, 2011. As of December 31, 2011, we recorded a dividend payable of $81.4 million to stockholders of record at the close of business on January 3, 2012, which was paid on January 17, 2012. In February 2012, our board of directors declared a regular quarterly dividend of $0.22 per share to be paid on April 16, 2012 to stockholders of record on April 2, 2012. In August 2011, our board of directors authorized the repurchase of up to $750 million of our common stock through December 31, 2013. This authorization is in addition to the $400 million repurchase program authorized in November 2010. As of December 31, 2011, we had used $500.8 million under the programs to repurchase 17.1 million shares at an average cost per share of $29.21. As of December 31, 2011, we had 369.9 million shares of common stock issued and outstanding. We believe that the presentation of adjusted diluted earnings per share, which excludes loss on extinguishment of debt, and loss on the disposition of assets and impairments, net provides an understanding of operational activities before the financial impact of certain items. We use this measure, and believe investors will find it helpful, in understanding the ongoing performance of our operations separate from items that have a disproportionate impact on our results for a particular period. Comparable charges and costs have been incurred in prior periods, and similar types of adjustments can reasonably be expected to be recorded in future periods. Our definition of adjusted diluted earnings per share may not be comparable to similarly titled measures presented by other companies. We anticipate our adjusted free cash flow for 2012 will decrease from 2011 due to an increase in cash paid for income taxes of approximately $140 million primarily due to bonus depreciation. acts of war, riots or terrorism, including the events taking place in the Middle East and the continuing war on terrorism, as well as actions taken or to be taken by the United States or other governments as a result of further acts or threats of terrorism, and the impact of these acts on economic, financial and social conditions in the United States. The risks included here are not exhaustive. Refer to "Part I, Item 1A — Risk Factors" in our Annual Report on Form 10-K for the year ended December 31, 2010 for further discussion regarding our exposure to risks. Additionally, new risk factors emerge from time to time and it is not possible for us to predict all such risk factors, or to assess the impact such risk factors might have on our business or the extent to which any factor or combination of factors may cause actual results to differ materially from those contained in any forward-looking statements. You should not place undue reliance on these forward-looking statements, which speak only as of the date hereof. Except to the extent required by applicable law or regulation, we undertake no obligation to update or publish revised forward-looking statements to reflect events or circumstances after the date hereof or to reflect the occurrence of unanticipated events.